The garlic has given up. To be fair it has had a horrible time with rust despite haircuts and careful watering and it’s now gone completely orange. It wasn’t going to get better so I thought it might as well come out. Great timing though because I need to put squashes somewhere FAST. It’s not the best harvest compared to others I guess. The bulbs aren’t very big, (though there are some approaching a decent-middling size), however last year I only had marbles…this year there are definitely individual cloves in the bulbs so this is not a complaint, it’s something of a triumph! To note for next year: the Carcassone autumn sown was all small and got rust quickly. The Provence Wight had the largest bulbs and was pot grown in the shed to start it off. Definitely do that again and also sit the cloves on some sharp sand. Digging the bed over was lovely. 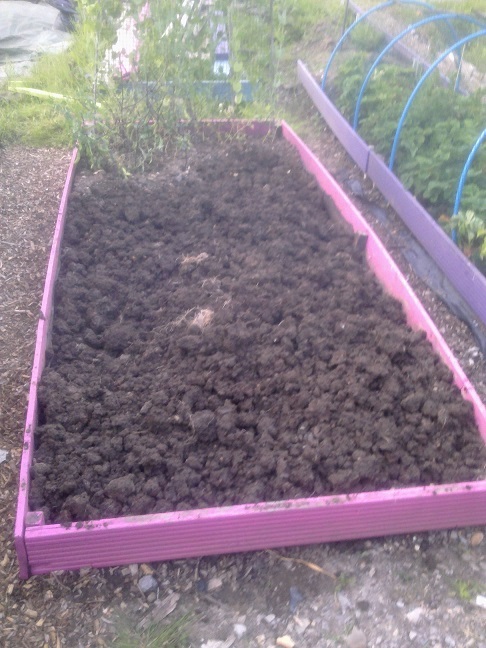 No weeds, couldn’t be easier to push the fork in and is full of worms. I am officially a fan of double digging/sifting. Picked broad beans, radishes and 5 sticks of rhubarb – the latter probably being the total of my rhubarb harvest this year. 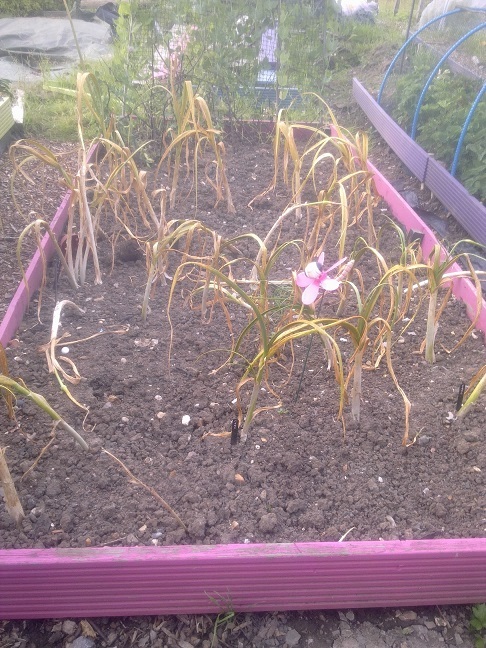 It’s not done well, poor thing – would probably also help if it were in the ground and not in a big pot. Lionel’s given me a watermelon as mine look awful. Bless that man! All the things I give him seem to die/go sickly almost immediately, and I am sure it’s nothing to do with his care…! Harvest value to date is £64.37 – 2/3 of that is PSB and strawberries. 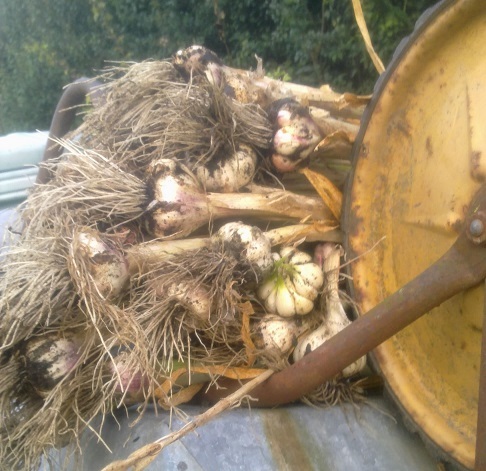 Now off to see how to dry garlic, and then work out a compromise for my less than ideal storage conditions…squashes in tomorrow, together with a long line of Douce Provence peas which are happily chitting in the kitchen and some chicoria.